The name Arkady Rotenberg has been in the news far more frequently than usual in recent months. The billionaire was hit by the first wave of European Union sanctions against Russia, and has already challenged this decision in court. Recently it was reported that the businessman has sold part of his assets to his eldest son. 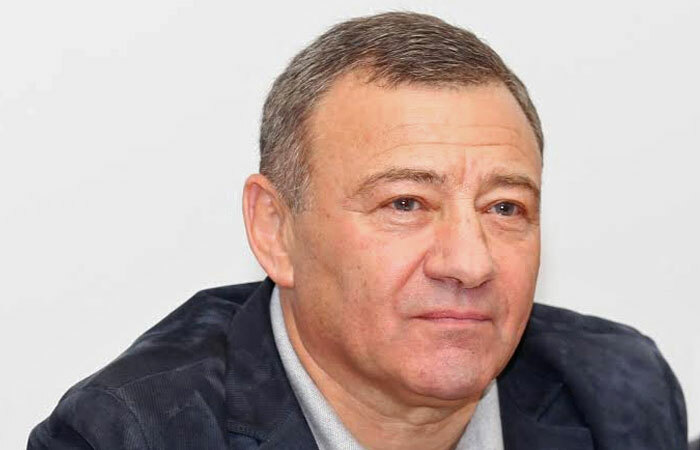 Arkady Rotenberg spoke in an interview with Interfax about whether there was a link between these two developments, the impact of sanctions on his business, his friendship with President Vladimir Putin and many other topics. Question: Mr. Rotenberg, you have been subject to sanctions for more than six months already. How have they affected your life, your business? Answer: In business, we have always been geared toward the domestic market. I am primarily talking about Stroygazmontazh (SGM). Yes, there are some negligible aspects. For example, one of the suppliers of special machinery and equipment for SGM was the American company Caterpillar, but now we can‘t buy equipment from them. Well, we were forced - we found a replacement. On my life, the sanctions do not, in principle, have any dramatic impact. Although psychologically this is difficult - I am not a politician, my rights have been violated, why can‘t I do something, go somewhere because of some nonsense. I recently visited Krasnodar Territory, then went hunting in Siberia. It was beautiful, great. I am not a hunter myself, but I liked watching. I even tried blowing a horn used to lure the deer. It didn‘t react to real hunters, but I apparently sounded like such a pushover that it immediately responded and decided to come fight me [laughing]. Q.: What are you expecting in your medium-term planning, that sanctions are here for a long time and it is necessary to somehow live with them, or that the situation might soon improve? A.: I don‘t have rosy expectations here. But as I‘ve already said, we mostly operate on the domestic market anyway. Yes, certain difficulties have arisen, but we are prepared for them and we understand how we will develop the company in the current conditions. Nonetheless, I‘m disputing the illegal restrictions imposed against me through the European Court of Justice. Q.: What pushed you to go to court? A.: We want to find out, on the basis of what the EU came to the conclusions that are laid out in the decision on imposition of sanctions. Having analyzed the situation, we see that the EU is largely citing sources on the Internet. Plus they wrote in some company there that I have absolutely nothing to do with. A.: Yes. Supposedly thanks to a stake in this company I benefited from the accession of Crimea. But I don‘t have any idea what company this is. It took a long time to ascertain. At one time the media also attributed Volgomost to me. It turns out, I‘ll write what I want and damn the consequences. I think that the legal proceedings will be long, but I have hope. Q.: Are you hoping more for a moral victory? A.: More for a moral one, of course. But if it is confirmed materially, I won‘t refuse. You know, it it is one thing to say: well, yes, sorry, we spurned you for nothing for two or three years, but it is another thing to pay for this. If money will be awarded by the court ruling, I‘ll spend it on some good project in Russia. Q.: The response of Russian businessmen and heads of state companies to the sanctions differs in the details, but is generally very similar: this is illegal, this hurts business, but we will manage and only become stronger. But how will we manage? How will we become more efficient? The experience of the 2008-2009 crisis showed that we know how to solve problems with the intervention of the state and its support, but not yet how to dramatically increase efficiency. How do you see the current situation, does it make sense to look for any pluses in the sanctions? A.: An economic slump is possible against the backdrop of the sanctions. This is natural. Saying that this is good and wonderful is foolish. On the other hand, today certain opportunities for development are emerging not only for large, but also for medium and small business. For example, in agriculture: now things are moving, some are investing in livestock farming, some are looking at fruit and vegetables. We thought about this two years ago, when there wasn‘t even any mention of any sanctions, and acquired a small parcel of land in a special economic zone in Kaluga Region. We are building large, modern hothouses there. Today we already have 20 hectares of hothouses. In other sectors of the economy, new technologies are now being very actively introduced, including at our assets. And sanctions played a certain role in this. Here it is after all like this - the peasant doesn‘t cross himself until he hears the sound of thunder. Well, now we‘ve started to work on our own financial system, because they‘ve shown us that they can organize disruptions from outside at the drop of a hat. Now SMP Bank cards work inside Russia, we organized interhost connections immediately after the imposition of sanctions. If we rely only on the state - give, give, give - nothing will work out. And I believe that the state already devotes enough attention to the development of domestic business. Q.: What should the state and officials do in order to help businesses? What do you expect from the government as a businessman? A.: Actually, in recent years the authorities have done a great deal for the development of domestic business. And not only business, for the whole country in general. Recall the Russia of the 1990s and compare it with today. Of course there are problems. We‘ve had the ‘good fortune‘ to live in a time of transition. This is difficult, but the positive results are obvious. Of course, there‘s still a host of things that need to be done, including for officials, who should above all help, not hinder, the economy. Unfortunately, this still happens. The judicial and law enforcement systems, I believe, need to be improved. It‘s also necessary to continue working on making it lucrative for businesses to work here, so that there is no red tape, no corruption, above all. Laws are written, but not always carried out. They are right when they say that if five-seven people work on a law, then millions work on how to get around them. Q.: You are well acquainted with the system of government procurements and purchases by state companies. Do you believe it is efficient? Does something need to be done with it? A.: Eliminate dumping. Pre-qualification, expert assessment is needed. We have very many research institutes that can be engaged. All the rules of the game need to be stipulated in the law. Today there isn‘t even a rationalized starting price. This is why we have one offering to build for 9 billion [rubles], and another for 20 [billion]. How can that be? I can understand a range at the level of 15 billion or 17, and even then 2 billion is also a lot. But when the cost differs manifold, it means something is not right here. We have many projects, but if things continue like this, there won‘t be anyone to actually build. And it‘ll be necessary to not hold tenders, but look for someone who can just honestly do the work. It‘s necessary to study the history of companies that bid in a tender. If they‘re bidding, but have never built anything and haven‘t worked in this area at all, how can one be sure that a major project will be realized? There is frequent dumping right now, they give a low price and win the tender, but then what? Thank God, at least they‘ve stopped using bank guarantee letters. Otherwise they brought the guarantee letter, received prepayment and that‘s it - goodbye, you won‘t see anyone again. Q.: Have you not had the desire to go to court over some lost tender? A.: I have. And we have gone [to court], and won some and lost some. We actually have very many lost tenders. It‘s a myth that we win everything. Here are this year‘s numbers for Stroygazmontazh: out of 164 tenders we won 36, in other words one in almost five! Competition is very tough, but it doesn‘t scare us. Q.: It was recently announced that your stake in Mostotrest was bought out by your eldest son Igor. The sale of part of your business to your son is what - a generational change program, an attempt to avoid sanctions? A.: This is a longtime program. I, of course, exercise, I feel good, but still, the numbers in my passport don‘t change because of this [laughing]. Sooner or later everything will be left to my children, and I‘ve always thought about what to do so that all this doesn‘t fall apart. How? In my view, for this they should do what interests them. I now look at my son, who‘s 15. Pavel lives and goes to school in St. Petersburg, plays hockey. And I‘m already thinking, where will he go, what opportunities are there? I‘m starting to consult with people, because it‘s already necessary to study some subject more in depth. He had a knee injury and he studied his knee thoroughly. And since then he‘s been diagnosing injuries for the kids he trains with. Maybe he will in fact become a doctor. If you just leave children money, will it bring them happiness? My little son, Arkady, says to me: papa, when I grow up will you give me your sports car? I say: no, I won‘t. You‘ll buy your own car. You‘ll earn money. I ask him - do you want to be a mechanic, an engineer? Yes, he says, I‘m interested in this! As for Igor, I especially gradually retreated from management in a number of companies and management transferred to Igor. Today he already understands business much better than I.
Q.: You are now talking about Mostotrest or about some other companies as well? A.: This is not only Mostotrest. I‘ve left myself SGM completely [Arkady Rotenberg owns 83% of the construction company and his brother Boris Rotenberg owns the remaining 17%]. I understand this, we made this company, built it up technologically. Igor bought a stake in Mostotrest. And now he‘s bought a stake in TPS Real Estate. TPS Avia I‘ve retained, because I‘m interested in working on the project at Sheremetyevo [International Airport]. Igor‘s partners at TPS Real Estate are [Alexander] Ponomarenko and [Alexander] Skorobogatko - they are very meticulous and upright businessmen, this is for the long haul. And Igor has his own and successful projects in the area of real estate. Igor has also bought out Gazprom Bureniye, a company that builds oil and gas wells. This business in the form that it is today is completely to his credit. Honestly, I‘m altogether proud of my children. And I always live with an eye toward my children. Right now they‘re writing all kinds of foolishness about me, but my children don‘t believe any of this. They laugh. For me, that‘s the most important thing. But it also happens like this: my son, who plays hockey, needs to go to Riga. He says: but will they even let me into Riga? I say: go, they‘ll let you into Riga. Just play well. If you play badly they won‘t let you in [laughing]. Q.: Many will be skeptical about what you said about the sale of the business to your son. Was the deal with Igor genuine? A.: Absolutely. With market valuations. We reached an understanding on the parameters of the deals between us two years ago already. Q.: Is there a debt component there? A.: Yes, there is an element of debt. But mainly it‘s Igor‘s own resources, obtained from the sale of the stake in SGM, dividends from the net profits of companies (SGM, Gazprom Bureniye, Mostotrest), as well as income from investments in other projects. Q.: Why did you do this as a transaction? You could have just given it to him. A.: I didn‘t give my son the business, although you‘re right, under Russian laws I have the full right to do this. I‘m confident that when a person pays his own money, this is business, realization of a big responsibility. But when you‘ve been given something for free, you don‘t feel this money. You‘re not afraid that you‘ll lose your own hard-earned money. Q.: You probably understand that this interview cannot dispense with this question. Your friendship with President Vladimir Putin - how does it affect your business? A.: Our friendship doesn‘t affect the business in any way. I‘ve said this a thousand times. I‘ll say it for the thousand and first. First of all, Vladimir Vladimirovich never at all picks up the phone and does not give any instructions to anyone related to anyone‘s business. If one were to ask him something, it could turn out the other way. Secondly, I genuinely value our relationship. When we met, he was 13 and I was 14, and we‘ve been friends ever since. Just imagine, soon our friendship will be 50 years old! A.: Right, this is why I value our friendship so much. We‘ve managed to carry and preserve it throughout our adult lives, through all joys and hardships. And the times, as you know, varied. I‘m speaking absolutely sincerely. Speaking about business, at times, on the contrary, it‘s been harder for me than for competitors. I can‘t use those, let‘s say, questionable methods of doing business and competition that are common here. Otherwise, I‘d let down a person with whom I am genuinely friends. Therefore, for me this relationship is above all a huge responsibility. As for the realities, I‘ve already mentioned the number of tenders for contracts that we‘ve lost. Frankly speaking, we go through all the same things as any other business. We also face arbitrariness - of judicial and fiscal bodies. We don‘t get any preferences, and I would never go to the president to ask for something. This means depriving oneself of the pleasures of companionship. If you start to ask, this is already a different relationship. But this way I can talk to him about any topic, about sports, about family, because we‘ve known each other for almost half a century. We have things to remember, people to remember. We discuss many human issues. He‘s a very interesting person to talk to. And, by the way, I have not seen him offend anyone in conversation, even with words. This is right: a person to whom much has been given should be tolerant toward people. Q.: Do you continue to spar together? A.: No, we no longer spar, after all it‘s liable to cause injury. In order to spar you need to warm up for a long time. We play hockey more now. We recently played with young people. They check me and him just the same. I tell them: what are you doing? We have one president, don‘t fool around! They go easy, of course, but when things get emotional - you better watch out. In general, you can‘t have too many real friends. Although some you talk to more and some less. When we came to the class, we had a core of five people: Vladimir Putin, Alexander Borodulin, Nikolai Kononov, Valentin Stepanov and me. And we remained there from the first enrolment. Alexander Borodulin, unfortunately, died. An accident. But the other four remained and we all talk to one another. I just called Nikolai Kononov, his son got married and they moved to Moscow. And they couldn‘t get their child a place in a kindergarten. That was the problem. I started inquiring and it‘s not just a problem, it‘s a mega-problem! We barely managed to help, I handled this issue myself. Q.: Have you read the "Rotenberg law"? Or, perhaps, you wrote it? A.: Another absurd situation - I have nothing to do with this law. I, by the way, am a strong advocate of observing copyrights and would not want to appropriate the achievements of others. Since I was not the initiator of the bill, giving it my name, to say the least, is inappropriate. Furthermore, I will never compensate my own personal losses at the expense of the country‘s budget. This is my personal position as an entrepreneur and a citizen. Q.: What is the current situation with the Italian assets, the seizure of which was linked to the emergence of the bill on compensation for lost foreign assets? A.: At present there are no rulings by a single Italian court about the seizure of any property in Italy from me. There is a so-called administrative freeze. What is this? I cannot pay for the maintenance of my two homes in Italy. Because at the moment I cannot make bank transfers to Italy. I say: take the money from me, please, I‘m willing to pay. Italian officials tell us: no, while there are sanctions we can‘t. What can I do? They created this situation themselves and now don‘t know what to do. I don‘t have an apartment in Italy, the newspapers made that up. There‘s a hotel in the center of Rome. It‘s operating, generating a profit. It‘s operating to this day. Q.: These days you associate yourself primarily with SGM, when you say "we"? A.: Probably, yes. SGM is my baby. Q.: Then a few questions about SGM. How much did this company cost? A.: We bought companies from Gazprom that later went into Stroygazmontazh during the 2008 crisis, when everything was crashing. We paid $400 million. By the way, our investments, not only in SGM but also other businesses, have totaled more than 55 billion rubles since 2009 - this refers namely to investment in the development of companies. Today more than 85,000 people work at our companies. Q.: Not too long ago some changes in the ownership structure took place there. Instead of a Cypriot company, you and your brother own SGM directly. Why did you do this - the campaign against offshore tax havens, insurance from sanctions? A.: Both factors. Firstly, this is indeed deoffshorization. Secondly, I took a look at what‘s happening in Europe - if they want they freeze [assets], if they want they don‘t freeze. Why do we need these risks? Q.: Sectoral sanctions have restricted access not only to financing, but also to technology. How will SGM develop in these conditions? The company is probably sensitive to the lack of access to western technology and equipment. A.: We had certain instances, related to Caterpillar and CRC, which I mentioned. We‘ve already successfully replaced everything, there are after all Chinese suppliers, Korean. When the sanctions were just imposed, we analyzed what was actually going on in our business and realized that the most protected organization in this regard was Stroygazmontazh, it operates only on the domestic market. Now, for example, I hope, we will build [the gas pipeline] Power of Siberia. Q.: What sections of Power of Siberia will you bid for? A.: Tenders have not been held yet. When they will be, we‘ll bid in a number of them and try to win. We have a strong company, we‘re proud of it. We bought several businesses that were stagnating and built a company that has become one of the leaders on the oil and gas construction market. We introduced new technologies, strengthened staff, changed the system of control and reporting. Now SGM operates like clockwork, we‘re proud of this. Q.: What kind of financial results do you expect from SGM this year? Better than in 2013? A.: I think that on the whole they will stay the same. Our contracts are for three years at least. There are also ten-year ones. We have a sufficient amount of work, the main thing is that everything goes well at Gazprom. In general, this business, frankly speaking, is complicated. In order to lay a pipe it is necessary to get so many approvals it‘s simply outrageous. Each section needs to be approved with a whole army of bureaucrats. Meanwhile, no one‘s changing the construction deadlines. The same is true with roads. Q.: One of the most investment-intensive projects you are involved in is the northern zone of Moscow‘s Sheremetyevo International Airport (calls for over $600 million of investment). Sanctions have probably made it more difficult to raise credit. This does not jeopardize the project? A.: We plan to use our own resources there. Q.: In other words, there will not be money from the National Welfare Fund (NWF) or borrowed resources? Q.: Is it already clear what ownership stakes the government and TPS Avia will have after the consolidation of Sheremetyevo? A.: We‘ve reached an understanding with the Federal Property Agency. The contract is already ready, it‘s been discussed by the board of directors. There were long arguments, negotiations. Painstaking work. We own service assets at the airport, it was necessary to reckon with the government. Now there is wrangling already over single percentages. Q.: Will you have more than 50%? A.: Yes, I think, more than a controlling stake. Now we‘re fighting for percentages. I think that in November we‘ll already finally sign everything. The project there is great. Both the terminal and the tunnel - we will connect South with North. A third runway, which the government will build. The hub will be beautiful. I‘m confident that many airlines will move there. Q.: Then you are going to think about consolidation with other airports? A.: Right now the concept for the development of the Moscow transport hub is being developed by the government. It will determine the program for merger of airports. Q.: Are you interested in the air transport business? A.: No, not at the moment. Throughout the world this is separate - infrastructure and carriers themselves. So I‘m not planning at the moment. Q.: Another one of your creations is SMP Bank. How do you assess the damages caused to the bank by sanctions? A.: Our bank has always been fairly conservative. We pursued a restrained credit policy, therefore it has not suffered especially. Furthermore, we primarily worked on the domestic market. Yes, there were problems with plastic, they blocked cards. But the cards now work inside Russia. And the most important thing is that we have not let down regular depositors, no one was hurt, we paid money to everyone. Q.: When SMP Bank decided to take on the financial recovery of Mosoblbank, did you realize the scale of the problems? A.: Honestly, no, not fully. Now I realize. Now we‘ve figured it out. There is already a hole of 97 billion rubles there, this is just what one of the big four auditing companies has calculated. But I think that there are still two or three skeletons to be found. Actually it‘s interesting, of course - they operated for so many years, is it really possible that no one saw anything? And given that everything was done crudely. The bank received 117 billion rubles for the bailout - and this is borrowed money, which everyone forgets for some reason. We‘ve already given out half of it to depositors. There is a formula according to which we can draw down this money. Q.: Will you merge the banks? A.: I‘ve already expressed my opinion - this should be two independent banks, SMP as SMP, and Mosoblbank is a separate matter. I think that ultimately everything will be alright, but more money will have to be invested, because otherwise nothing will work out there. Q.: You have a project to produce fertilizer in the Far East. It is also fairly capital-intensive. Will it be stalled due to the sanctions? Is external financing needed there? Perhaps you will take on some additional partners? A.: When we began the project, we thought about attracting Japanese companies. They build such plants well, they have good technology and they are prepared to buy a derivative of the production process - methanol. And they, by the way, have not declined yet. Therefore, in principle, the financial plan has remained. But I can‘t say exactly at the moment when the project will be realized. The ball is now in our court. We need about 3.2 billion cubic meters of gas to start. Gazprom is now thinking about this; they have two fields there, but they‘re quite complex. If Gazprom provides these 3.2 bcm, we will certainly build. I think that we‘ll figure things out with the finances. Partners could also be brought in, the project is interesting after all. A.: It didn‘t fall apart. I declined it, which I‘m happy about. A.: The business was new to me, I wanted to have a look at it, give it a try. But when I calculated everything, analysed the level of the debt burden, I decided not to enter this business. This was simply expensive for me. Q.: The television market is now going through difficult times. In light of this, are you concerned about being disappointed by your recent media investment - the purchase of control in Krasny Kvadrat? A.: I can‘t yet call myself a major expert in this sector yet. But I like being involved in a business that is related to creativity. Krasny Kvadrat is one of the leading producers of television content in the country. This company has huge potential. And I‘m genuinely interested. Now, of course, I already watch [reality talent show] Golos differently [laughing]. Q.: Can you have an influence? A.: No, I can‘t. That‘s the beauty of this project: they actually don‘t book anyone. You can come and win. Whoever is the best, will in fact be the best. Q.: About a year ago, you became chairman of the board of directors of publishing house Prosvescheniye. Why? Is this a social or business project for you? A.: I am familiar with this, I have a pedagogical education and I defended [my dissertation] in the pedagogical department. When my future partners at Prosvescheniye started to tell me about what is happening here in the area of educational literature, when I found out that we have dozens of textbooks not only on history, but also on physics or mathematics, I realized that everything is not really great here. The quality of education is very important. I would like children not to leave, but to go to school here. For me this is a significant project and largely not financial. Although it‘s business as well - there is profit there, there are dividends. This should in fact be a decent business - you produce and sell a quality product in the form of textbooks for adequate money, and don‘t reach an agreement with bureaucrats for kickbacks. Q.: The standard textbook has caused a lot of controversy. Like-mindedness is not to everyone‘s liking. A.: Well, first of all, we‘re not talking about the only textbook. But there are, after all, some basic facts. If the Patriotic War was in 1812, that‘s when it was. One can‘t write that it was in 1986. There are facts and assessments proven by time. But there can of course be a difference in assessments of some events or individuals that are not completely understood, and this is right. We write about one person now that he is such, but then dig further and, no, he‘s completely different. Q.: Do you cultivate like-mindedness in your company? A.: No. Everyone can have their own judgment. And every opinion needs to be respected. Thank God that there are no identical people. Then it wouldn‘t be interesting. Q.: You have been working with Gazprom for many years. Has it become more difficult or easier to work with the company recently? A.: Of course, it‘s already easier now. Firstly, we have a solid company, it‘s known at Gazprom, we don‘t need to prove that we‘ve come in from the street. We haven‘t failed a single project, although there were very difficult ones among them. When we go into a tender, they already know us, they trust us, because we‘ve never let anyone down. Q.: Have you ever wanted to ‘institutionalize‘ as a businessman, for example run for a leadership position in the Russian Union of Industrialists and Entrepreneurs (RSPP)? A.: I‘m periodically invited to big business meetings. But I‘m not really drawn to working on the public platform. And again, they‘ll say that the president positioned his friend. Q.: If you eventually hand over all your businesses to your children, what will you do? A.: I have thoughts about doing what I love best in future, what I did before. Q.: You want to return to coaching? A.: Not coaching, probably, but to organizational work. I‘ve not only been a coach, but also the senior coach in the National Volunteer Fitness and Sports Association of unions, director of a children‘s sports school. I‘m interested in this. This is why I‘m now involved in Dinamo. Q.: Can sports ever become a business in our country? A.: Hockey is closer to this. We have now built a large venue at ZiL. There are three hockey rinks there: one for 12,500 spectators, the second for 3,500, where youth teams can hold games, and the third for 500. In February we already plan to hold a KHL playoffs game there. A.: Football is more difficult. These are big stadiums, try filling them. Once again, the climate. But I like how Dinamo is playing now. Progress is evident. The team has the ambition to fight for the highest places in the championship. For the whole Dinamo movement, the genuine revival of its spirit, this is very important. Q.: How is the process of merging the Dinamo football and hockey clubs going? Will it happen or not? Is it necessary to reach an agreement with state bank VTB? A.: Yes, there are some difficult issues that require serious work. We wanted to merge, but it‘s a different time now and VTB is already thinking a little differently about this. They own shares in the football club, while the hockey club is not incorporated. There are difficulties, but we‘re also helping the football club. Although legally there is no unified club yet. Q.: So you have abandoned the idea of a merger? You are happy with an informal partnership? A.: Ideally, all team sports should be merged - football, hockey, volleyball, basketball. But on the whole, yes, for now I am happy with the current collaboration. And there is nothing to merge on yet - neither football nor hockey have their own arena. First the Dinamo stadium needs to be renovated - there will be a football field and a hockey venue there under one roof. Q.: You are the senior vice president of the Russian Judo Federation. At the last Summer Olympics, the results of our team were outstanding, which no one expected. Is it realistic to repeat them at the next Games? A.: At the London Olympics we really did achieve a phenomenal result, like neither the USSR nor Russia, and no one at all in the world had ever had - we won three gold medals in judo, not to mention a silver and bronze. Actually this is difficult, painstaking work. Particularly since we are regarded ambivalently, and this is after all a very subjective form of sport in terms of judging. We don‘t need help, the main thing is that we don‘t get chopped. In London, of course, the stars aligned. I don‘t know if something like this will happen again. Q.: Why did you, a person from the sports world, go into business? A.: After the army I fulfilled the standards for a master in sport in sambo and judo and went to work as a coach. My friends and I found a rundown space, laid the carpet ourselves and went to work. A good team formed. The kids became city champions, then we had European and world champions. You need to do your work honestly and think about how to do it better. That‘s all. And then everything will work out. But I had a dream - to bring my family together, because my younger brother Boris went to Finland in 1991, my daughter lived in Germany. And I wanted to bring everyone together. I was ten when my mother died, Boris was five. And at ten years I understood that I am responsible for my brother. And somehow that is how it went. And then business helped bring everyone together. Q.: How did you earn your first capital? A.: It was 1991. We formed the cooperative Sova, each letter representing the name of one of the founders. We did something like a department for holding competitions. We handled accommodation, staging and servicing of sports competitions. Earned a profit, did quite well. Then we went into business with my brother, sometime in the mid 1990s. We traded gas condensate from Bashkortostan. We took gas condensate from Bashkortostan, supplied it to Finland by barter - through the company Anirina. We shipped condensate there, and from there equipment, furniture. Then there was the company Gaztaged, pipe supplies to Gazprom. A.: We, by the way, organized import substation in the pipe industry then, long before sanctions. All of our plants began making large-diameter pipes. We sat pipe producers at the negotiating table and offered long contracts, they began to understand the potential - then development got going in the sector. Everyone built mills, for 420-mm pipes there was complete import substitution. We still don‘t have thick-walled pipes that are laid on the seafloor, though we are now slowly trying to solve this challenge. Q.: Do you have enemies in big business? A.: No, probably. In any case, I don‘t know them. I think that there are some enviers, certainly. Arkady Rotenberg was born in Leningrad (St. Petersburg) on December 15, 1951. He graduated from the Lesgaft Leningrad State University of Physical Education, and worked for more than 15 years as a sambo and judo coach at Leningrad sports clubs. He is a merited coach of the Russian Federation and merited physical education worker, a doctor of pedagogical sciences and author of more than 30 academic and research works on the organization and management of the training process. He has been the general director of the Yavara-Neva judo club in St. Petersburg since 1998. Rotenberg joined the board of directors of SMP Bank in 2002 and has been chairman of the bank‘s board of directors since 2004. He is the principal owner of gas industry construction company Stroygazmontazh (SGM) and president of the Dinamo Hockey Club. Igor Rotenberg, born on May 9, 1973 in Leningrad, graduated from the Higher School of Privatization and Business with a degree in law. He was deputy head of the fuel and energy sector property department at the Property Ministry in 2002-2003, and head of the transport and communications property management department at the Property Ministry in 2003-2004. In 2004-2005, he was vice president and head of the property management and organizational structure department at Russian Railways (RZD). Igor Rotenberg became chairman of the board of directors of OJSC NPV Engineering (manages shares and stakes in OJSC TEK Mosenergo, LLC Gazprom Bureniye and OJSC Mostotrest) in 2006; vice president of SMP Bank in 2008; chairman of TEK Mosenergo in 2010; and chairman of Gazprom Bureniye in 2011. He is a coowner of Gazprom Bureniye, Mostotrest, TEK Mosenergo, Scanex Research & Development Center and LLC Glosav. He is married and has three children.